Each temple around the world is a special house of the Lord. 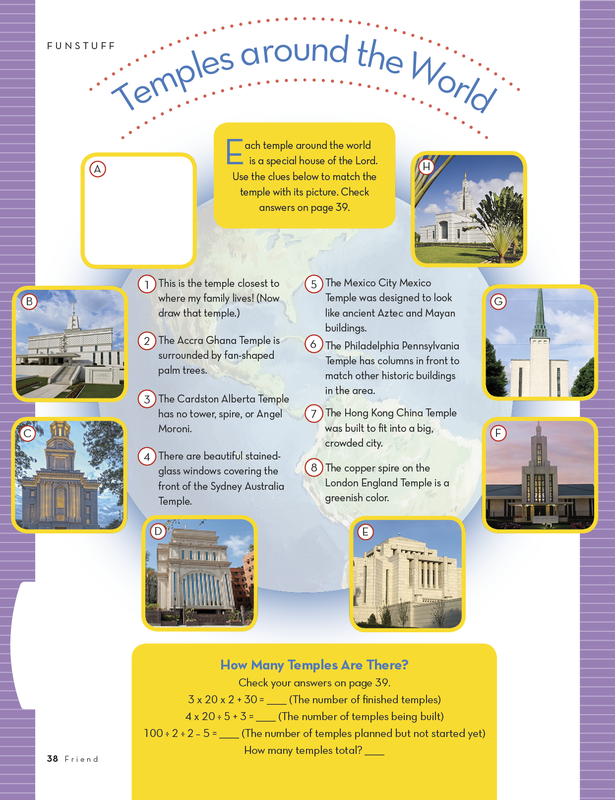 Use the clues below to match the temple with its picture. Check answers below. The Accra Ghana Temple is surrounded by fan-shaped palm trees. The Cardston Alberta Temple has no tower, spire, or Angel Moroni. There are beautiful stained-glass windows covering the front of the Sydney Australia Temple. The Mexico City Mexico Temple was designed to look like ancient Aztec and Mayan buildings. The Philadelphia Pennsylvania Temple has columns in front to match other historic buildings in the area. The Hong Kong China Temple was built to fit into a big, crowded city. The copper spire on the London England Temple is a greenish color. How Many Temples Are There? Check your answers on page 39.